Get Wiltshire Walking Challenge 2019! Our first Challenge walk of 2019 took place at Bishopstone on Thursday 4th April. 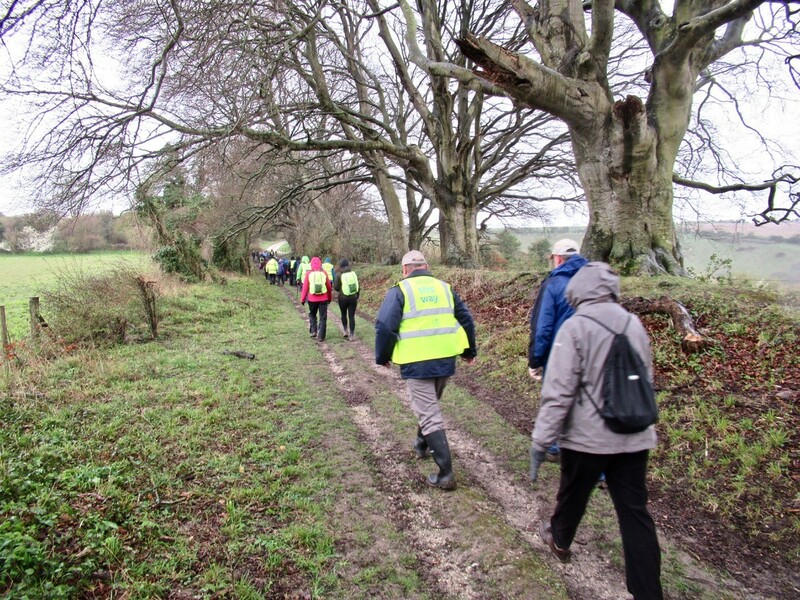 In extremely wet and windy weather 122 of GWW’s registered walkers came together in Bishopstone, taking part in 1 of 3 choices of routes available; 5miles, 3 miles and 1.5 miles. The original objective of our challenge series of walks was to offer the county’s residents an opportunity to increase their physical activity with the added benefit of being able to explore areas of the county they would not normally visit or walk around. This year the whole series is based on previous challenge walk routes which walkers have enjoyed. The 5 & 3 mile routes provided fabulous views across the chalk downs with stunning scenery and wide-open spaces and Salisbury cathedral spire appearing on the horizon, albeit a little hazy in the mist of rain! An addition to the programme, this year, is the feature of a very short or starter walk on our challenge events to encourage those who have recently joined us and those who may not be quite so energetic and able to participate in these events. Those engaged in the Starter walk were able to enjoy a stroll around Bishopstone village whilst taking on board some local history. These events encourage our walkers from across the county to ‘Come Together’, a key theme for GWW this year. The walks themselves have generated many lasting friendships, with walkers looking forward to meeting up with their counterparts across this great county. Next Challenge event is Wednesday May 5th in Seend. We look forward to seeing you there!